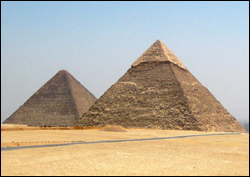 The Pyramids of Egypt has been #1 on my world wonder list since I began that list in 1968. The Pyramids of Egypt are far bigger than most people would imagine. They are even more amazing when we consider that they were built nearly 4600 years ago. Pharaoh Khufu's pyramid was built during his reign, 2589 to 2566 BC. The mummies in all three tombs were removed long ago by sophisticated tomb robbers. They also took priceless buried treasure. Pharaoh Khufu's pyramid is the only true surviving member of the famous olden list. Click Ancient Seven Wonders to read my 8-page section on that list. I am the only person who writes about the Ancient Seven Wonders who did firsthand research at all seven wonder locations.